In ninth pAsuram – AzhwAr says that while removing the obstacles and bestowing the eternal kainkaryam for those who approach him, emperumAn does that being together with periya pirAttiyAr (srI mahAlakshmi) with fondness. 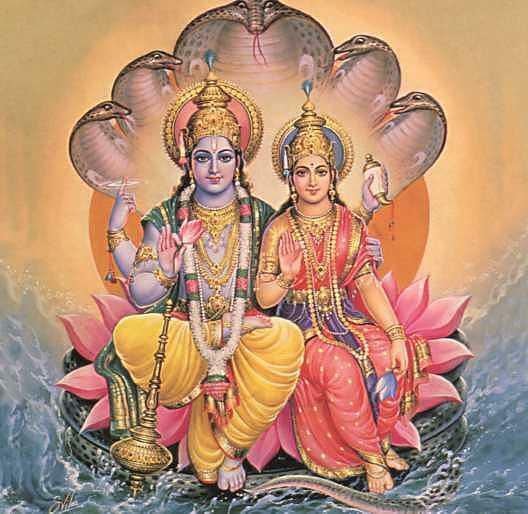 Subsequently, bhagavAn who is sriya:pathi (husband of srI mahAlakshmi) removes the obstacles out of his will. Ninth pAsuram – When asked “Just for surrendering unto him, would he remove the obstacles and bestow the result?”, AzhwAr says “Should we just see him? Should we not see who is accompanying him? The one who said ‘na kaschinnAparAdhyathi‘ (there is no one who does not commit mistakes – srI rAmAyaNam yudhdha kANdam 116.45) is right next to him”. sarvEsvaran srIman nArAyaNan is the singular beloved/intimate husband of srI mahAlakshmi who is the ultimate manifestation of femininity. emperumAn who has such greatness of lakshmI sambandham will bestow the goal which is difficult to accomplish even by most virtuous means and will destroy the karmas that are in the form of puNyam and pApam. tharum – he will give. There is no doubt. the goal that are explained in sAsthram as very difficult to accomplish. srI mahAlakshmi – the embodiment of the ultimate goal attained through virtuous means; since he is the undisputed/beloved husband of such srI mahAlakshmi – he is the most distinct master. As explained in srI rAmAyaNam AraNya kANdam 37.108 “apramEyam hi thaththEjO yasya sA janakAthmajA …” (that srI rAma’s valour that is inconceivable, that srI rAma who is the dear consort of sIthA dhEvi who is the daughter of janaka mahArAja) – only srIman nArAyaNan has the glory of being the husband of srI mahAlakshmi. perumai udaiya pirAnAr – pirAn – upakAraka (one who does favours) – one who is the embodiment of blessing his devotees; pirAn who is great due to being lakshmIpathi (husband of srI mahAlakshmi). irumai vinai kadivArE – puNyam and pApam are only different in namesake for those who are seeking mOksham (liberation – eternal kainkaryam in paramapadham), since both bind them in this samsAram. So, bhagavAn removes both of them [arumpadham – In his varadharAja panchAsath slOkam 29 “sadhyas thyajanthi varadha“, vEdhAnthAchAryar explains that puNyam and pApam are like gold and iron shackles respectively since puNyam leads one to svargam and pApam leads one to narakam – as both svargam and narakam are bindings within this material realm, they both are to be given up by mumukshus]. This entry was posted in thiruvAimozhi, thiruvAimozhi 1st centum on August 30, 2015 by Sarathy Thothathri.